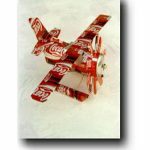 Now your can build your own Aluminum Can Airplanes. 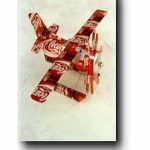 The airplanes are made from recycled aluminum cans. They make spectacular Windmills and Decorations. This is a “traditional” Adirondack Fanback Chair design. The comfort comes from the lower back support, curved back and the contoured seat. See the thumbnails below… Save time and money and order our special Corrosion Resistant Hardware Kit that includes all the hardware needed. Don’t forget to check out the Adirondack Tables and the Adirondack Foot Rests. Our Adirondack Fish Chair & Footrest is uniquely designed and very easy to build. It has a deep, angled seat and wide arms, the perfect place to rest your elbows and hold a tall glass of lemonade, a plate of food or a book. If you live near a pond, river, lake or an ocean then this chair is a must.. Or even better, if your a fishermen. In fact what a great gift this makes for any person who likes to fish. For those of you looking for that “Craft Show Winner”, look no more. This is it, the “Adirondack Fish Chair & Footrest”. This set of plans comes with 7 large, 24″ x 36″ blueprints. Once again, the plans come with 7 large blueprints that have step-by-step instructions, with detailed illustrations and the best of all; Full Size Templates. You don’t have to spend hours to re-draw the plans from a 8 1/2″ x 11″ sheet of paper that you downloaded from the internet. The Chair measures 36″ W x 36″ D x 47″ H.
Our Adirondack Dolphin Chair & Footrest is uniquely designed and very easy to build. It has a deep, angled seat and wide arms, the perfect place to rest your elbows and hold a tall glass of lemonade, a plate of food or a book. For those of you looking for that “Craft Show Winner”, look no more. This is it, the “Adirondack Fish Chair & Footrest”. This set of plans comes with 7 large 24″ x 36″ blueprints. It’s very easy to build, because we have step-by-step instructions, with detailed illustrations and we have full size templates. You don’t have to re-draw the plans from a 8 1/2″ x 11″ sheet of paper. The Chair measures 36″ W x 36″ D x 47″ H.
The same award winning design Adirondack Chair. Use with or without the extended footrest. Don’t forget to check out the Adirondack Tables, Plan No. 5111. Our Beer Bottle Adirondack Chair & Footrest is uniquely designed and very easy to build. It has a deep, angled seat and wide arms, (the perfect place for a bottle of beer, a plate of food or a book.) For those of you looking for that “Craft Show Winner”, look no more. This is it, the “Beer Bottle Adirondack Chair & Footrest “. It’s very easy to build, because we have step-by-step instructions, with detailed illustrations and we have full size templates. You don’t have to re-draw the plans from a 8 1/2″ x 11″ sheet of paper. The Chair measures 37″ W x 80″ L x 47” H.